Find a vacation home to rent in Egeo from our list of vacation rental properties. Campaya has over 21 vacation homes available in Egeo, which give you the possibility to locate a unique accommodation in Egeo which completes your check-list in search for the perfect self catering vacation apartments in Egeo or vacation villas in Egeo. The island of Syros is located in the heart of the Cyclades. 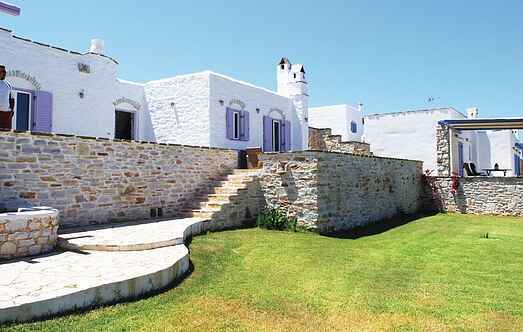 The house is in Akrampeli, southeastern part to the beach of Ampela. This beautiful new vacation home and comfort has two different rooms and is located in a residence on the island of Paros, one of the most beautiful islands of the Cyclades. The biggest island of the Cyclades, Naxos can offer a large variety of activities, places to visit and beaches to relax. Almost in the center of the Cyclades, the island of Syros is unique, thanks to the combination of its natural beauty, its archeological sites and the hospitality of its residents. 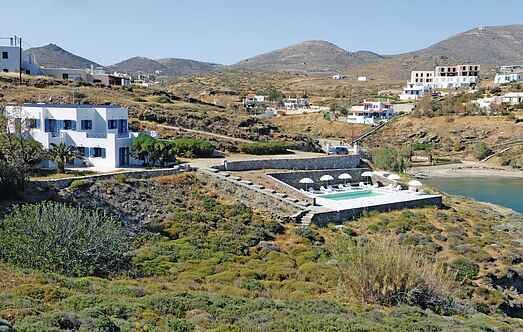 This vacation rental is a flat situated at the second floor of a modern stone building in the area of Aghios Philippos of Batsi on Andros Island. This cozy house is situated on the coast, in a really big plot with many holiday homes and within walking distance from the port. Syros Island is famous for the neoclassical architecture. This villa, recently renovated following the neoclassical approach, is dated back to 19th century.